Show notes are located at http://entertainmentlawupdate.com. The Latest episode of my Entertainment Law podcast, Entertainment Law Update, is now available for your enjoyment. Listen here, or subscribe and download in your favorite podcast listening app. 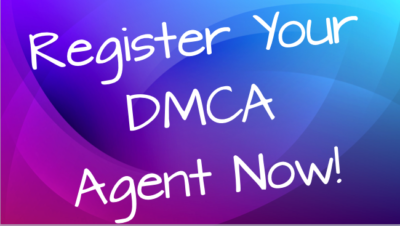 Register your DMCA Agent by December 31 or risk losing your “safe-harbor” protection against copyright infringement lawsuits. Earlier this year, the copyright office finalized the plan to modernize the process for registering your DMCA Agent. Registration offers important protections for all operators of online service providers. This includes you if you have a website, blog, podcast or other online presence. Operators of sites with a registered DMCA Agent can benefit from a “safe harbor” providing immunity from certain kinds of infringement suits if they comply with some basic protocols. I wrote about this several years ago here (https://firemark.com/2015/07/10/have-you-filed-your-dmca-agent-designation/). The new process is very simple, is handled online (https://www.copyright.gov/dmca-directory/), and unlike the old system costs only $6. Also unlike the old system, your registration will now need to be renewed every three years. The text of official notice can be seen here. Some of my clients who’ve received this have asked whether this is a real email from the Copyright Office. Have no fear. It is real. The Copyright Office has announced that it will be sending these notices several times before the end of the year. But, given recent data breaches in the news, it is worthwhile to be vigilant about any notices asking you to provide business data or payments. Be sure you’re visiting legitimate government websites, and only make payments through the copyright office payment system. If you’re unsure about it, contact me for help figuring out the authenticity of any notice you’ve received. And remember, you will need to complete the online registration by December 31, 2017, and renew it every three years, to continue to enjoy the valuable protections of the DMCA safe harbor. Need help? Contact me now! While this post is not, strictly speaking, on the “Entertainment Law” beat, several clients asked me about it, and I addressed their concerns in my e-newsletter (sign up in the sidebar). On recommendation from a friend, I'm reposting it here as a service to readers. DISCLAIMER: I'm not a data-security expert, and the above should not be considered legal advice. This is not an exhaustive list of recommendations. If you deal with sensitive, confidential or private information, it's your responsibility to ensure you're following prescribed protocols. If you need help, contact me, and I'll be happy to refer you to a qualified expert. By now, you've certainly heard that credit reporting company Equifax suffered a massive data breach over the past few months, and that means that we are all much more vulnerable to identity theft. According to news reports, the breach affects somewhere around 143 Million people… nearly half of the U.S. Population. The hackers not only got identities, they also stole addresses, Social Security numbers, birth dates and driver’s license numbers, and even some folks' credit card numbers. A few of my clients and friends have asked me what they can do to protect themselves. Here's what I've learned.